“One will not gain inner peace without a certain degree of loneliness.” In the 1990s, when Du Xiaotong was admitted to the art school and he chose the subject of plastic arts as it was short of practical functionality, many friends disapproved of his choice. 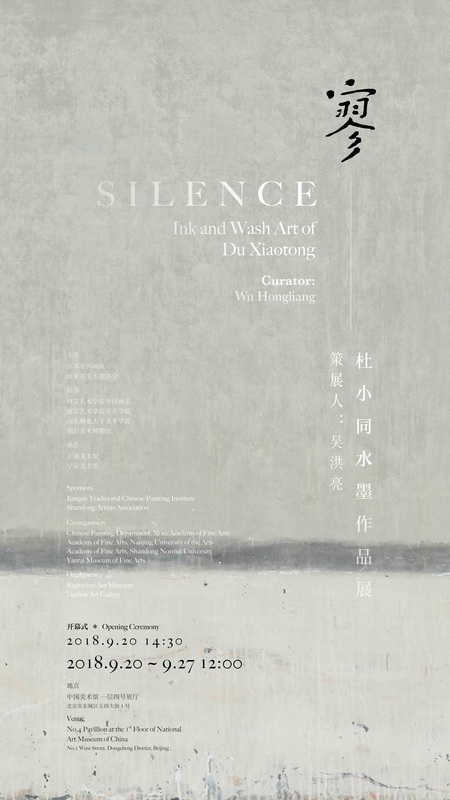 However, Du Xiaotong continued with his choice and even chose the most “traditional” Chinese painting. 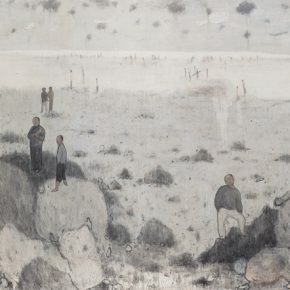 During the period of study at the Department of Chinese Painting at the China Central Academy of Fine Arts, Du Xiaotong gradually felt a spiritual resonance, “so that I found I had chosen the right one.” He has persisted in this and has continued with this to today. 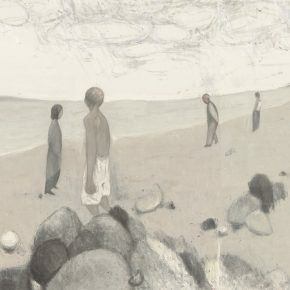 Reviewing the creations of Du Xiaotong over the years, “sea” has been continuously depicted. 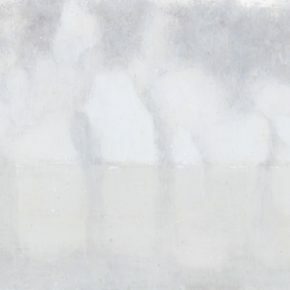 The vast, fragmented, cold and misty scenes are regarded as objective scenes to be subjectively portrayed. From ancient to modern times, many scholars and literati have written poems on the sea, which is diverted from the demands hidden in the spiritual depth of adults. 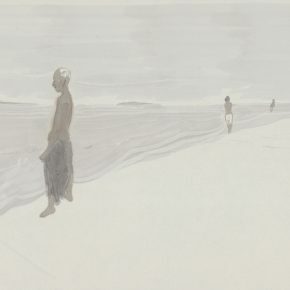 We are constantly recalling the beaches where we often played during childhood – waves, water, white sands, shells, and a series of footprints that we could not retake. At that time, we were too young to know much about life, and we tried to grasp a handful of sand which is a symbol of the expectations of life. However, we were unprepared to be driven forward step by step by the train of growth. We once embraced joy and warmth, and we have experienced pain, sorrow, or unintelligible loneliness, or attractive and sorrowful love. We are together with the majority of people gradually moving away from the blue beach filled with innocent taste. It is lonely, cold, gray and huge … the sea under the brush of Du Xiaotong is not brilliant. The enthusiasm for the “sea” does not originate from a temporary inspiration or an unspeakable sudden action, sometimes it is a glimpse of lingering thoughts and attempts. On a rainy day in 2001, Du Xiaotong, on his way to school, saw the passers by walking in a hurry on the campus. 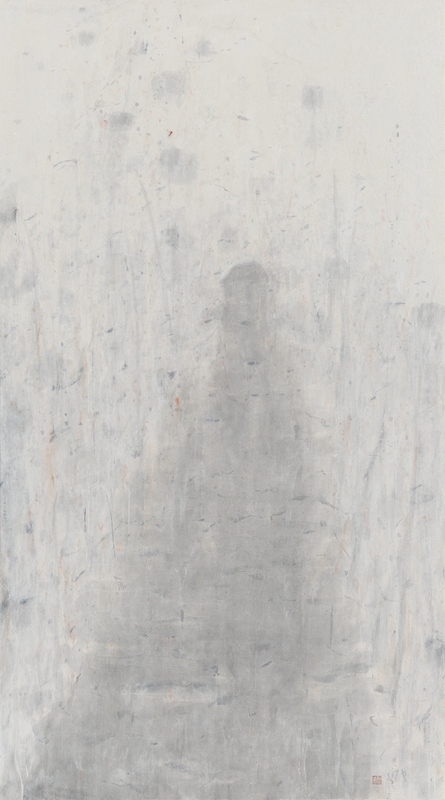 Under the gray sky, it seemed to automatically form a moving painting of ink and wash. “I suddenly have a direct feeling.” With the use of heavy ink color and twisted bodies, Du Xiaotong’s first “Rain” series was born. Since then, Du Xiaotong has been looking at the topic of the relationship between “people and the environment” for a long time. The first batch of red human bodies appeared in 2003, with naked human bodies abandoning the shelter of clothing. The large-block bright red and ink sketches directly formed a visual dialogue, and these pieces were Du Xiaotong’s early “Numbered Portraits” series. “In the beginning, I drew a lot of human bodies, and I badly yearned for expressing myself through paintings at that time, and focusing on the rethinking of bodies. But then I began to realize that it did not correspond with tradition. I personally still yearned for tradition, and I thought that people and natural society, and the surrounding environment were needed to be connected, and a character was given a value in the environment. He also spent a long time on exploring and thinking about it – how are characters combined with the environment? What kind of environment is combined with characters? Du Xiaotong tried a lot of traditional symbols and eventually chose a realistic form. 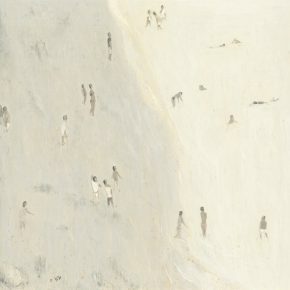 The familiar and illusory characters were placed in the scenes of the paintings by the artist, and all of them do not have a clear facial feature. Du Xiaotong said: “I have never strengthened the specific image of a person, and I only portray a living person without any features.” They may be people that you come across throughout life. He may be an old shoemaker located in the corner of the home or community, or a courier who rushes to the door every week to remind you to pick up a parcel, or the expressionless office staff passing by every day in the street, or the exhausted shadow of a man surrounded by the crowd in the subway which is reflected on the gray window, with a blurred face that no one cares about. 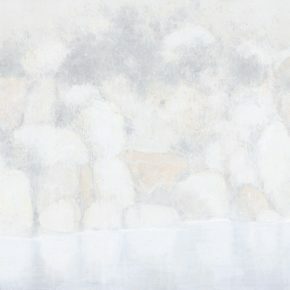 In the works recently created by the artist, it is easy to find that the character shapes that Du Xiaotong originally persisted in have gradually become smaller and smaller and even “dissolved”, and they are replaced by a wide scene on the screen.  Using sharp lines to conceal the vast unity, and the screen is more introverted, and we can see a few clues from the red brush strokes that appear in the gray tone. It seems that after constantly practicing and thinking, Du Xiaotong found an inner balance, and those sharp and unassuming expressions are hidden under a mild appearance. After practicing over many years, his artistic conception has been sublimated. 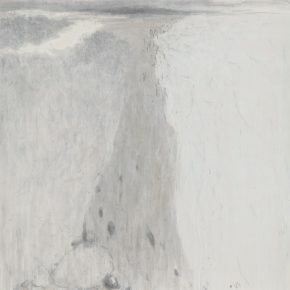 For example, Du once focused on “the realm with me” which was proposed by Wang Guowei in the “Jen-Chien TZ’u-hua”, in which there is the poem of “My tearful eyes ask for flowers, but they fail to bring an answer; I see red blossoms flying over the swing”, and now Du Xiaotong turns his concern to “the realm without me” as it was expressed in the poem of “While picking asters ‘neath the Eastern fence, my gaze upon the Southern mountain rests.” He now believes that “The joys and sorrows are both part of the realm of the heart”. 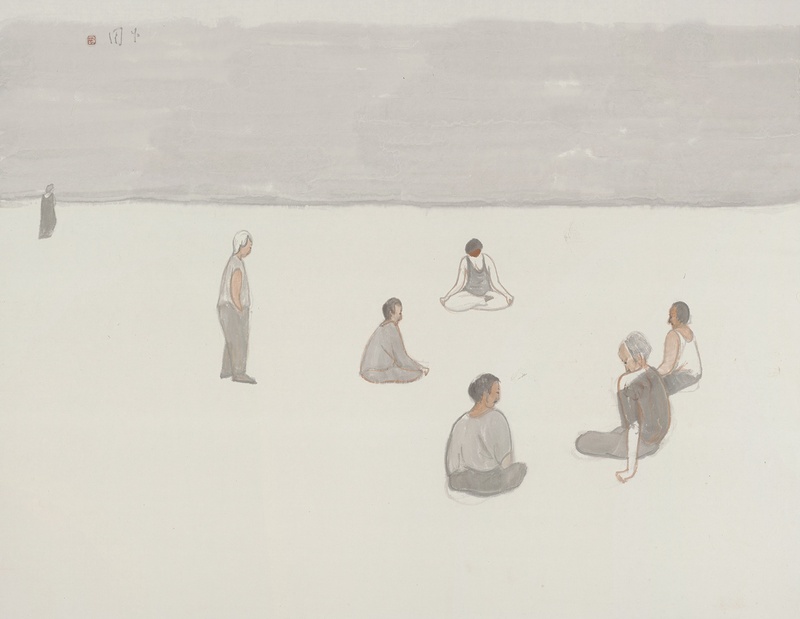 Du Xiaotong’s ink and wash are not completely detached from tradition, and he believes that the true tradition is deeply rooted in the heart. 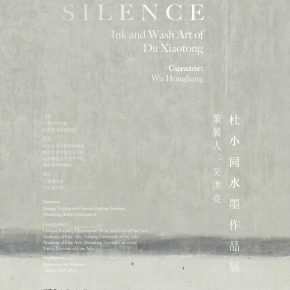 In his paintings, it reveals the alienated and unemotional feelings of Chinese literati, and this modesty and honesty easily touches the hearts of current people after thousands of years. 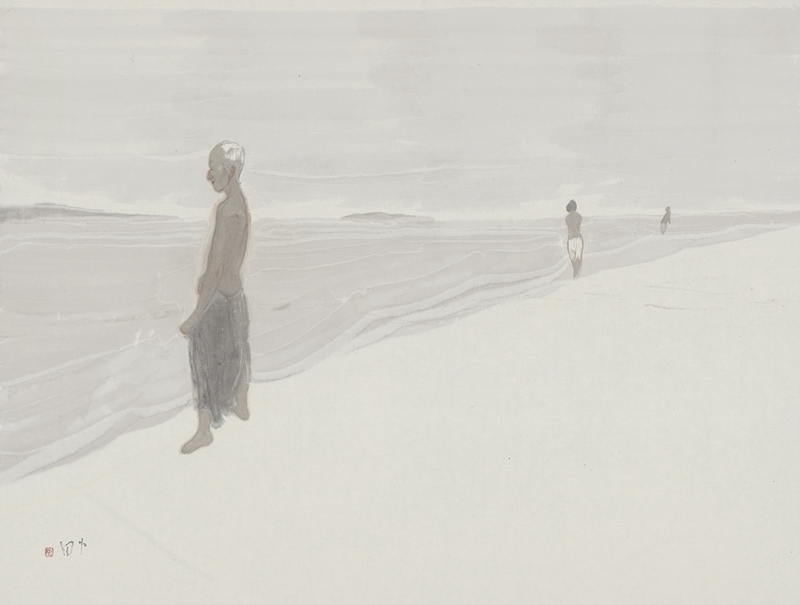 When I stand in front of his paintings, it seems that I have become an ambiguous figure from the painting, trapped in the vast ocean, and unconsciously coincided with the gray figures disappearing in his paintings. It is small, powerless, but struggling. We urgently need a piece of pure land to take a breath in the ever increasing pace of life. At this moment, we seem to understand why previous generations were indulged in the mountains and rivers, accompanied by the breeze and the bright moon, and sighed that “embrace joy and pleasure every day of your flourishing life”. “The sense of loneliness and tragedy comes from the loss of eternal conviction. Although God was dead and the absolution has collapsed, the pursuit and exploration of absolution is still the only way to lead to the spirit of life. If eternity becomes reality, what can we explore? 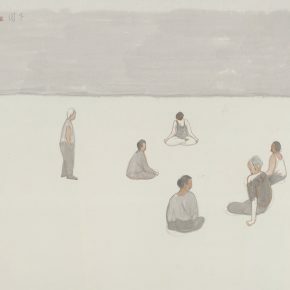 “In Du Xiaotong’s view, the spiritual exploration of modern people is more tragic than any period in history. 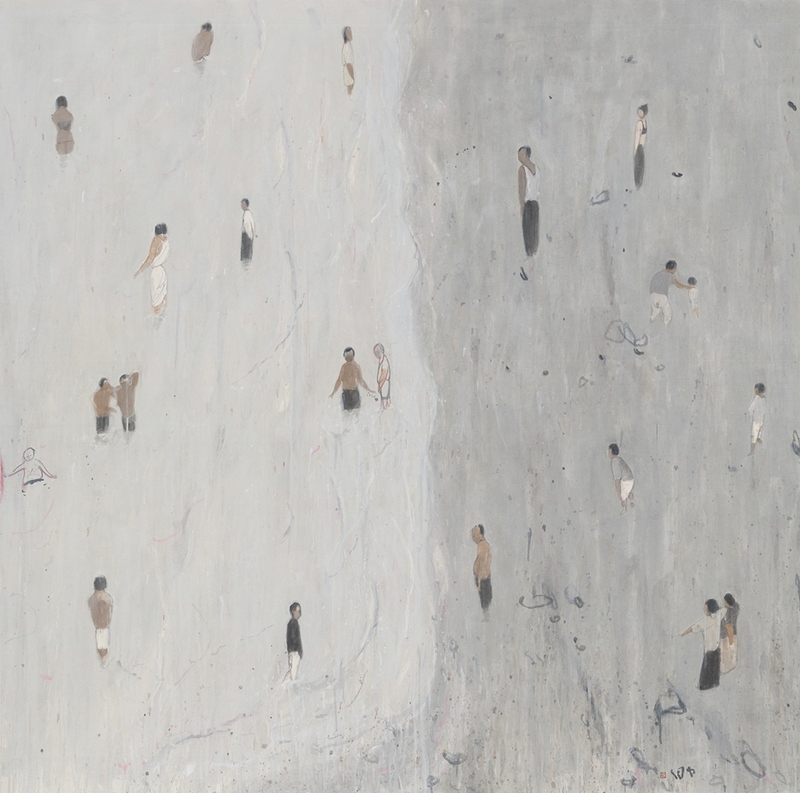 As a spiritual existence, it is also shown as loneliness, “returning to the normal life, it is naturally sensitive to people’s eternal situation and current encounters.” That is why Du Xiaotong handled complicated matters with ease instead of yelling at the top of his voice. 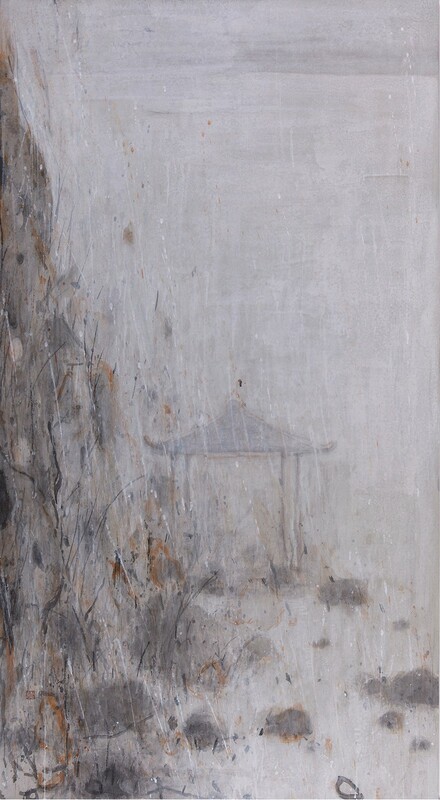 “Bamboo and Stones” have always been important objects of traditional Chinese paintings. 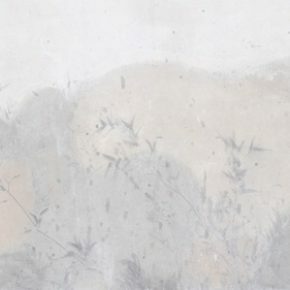 In the painting of “Elegant and Free from Vulgarity” by the painter of the Tang Dynasty Sun Wei, it shows the seven sages of the bamboo groves indulging in the bamboo forest. 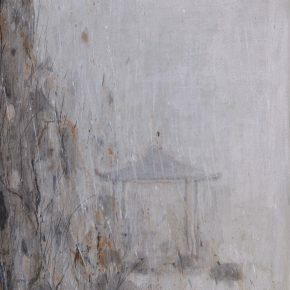 The Northern Song Dynasty painter Guo Xi’s “Keshi Pingyuan Tu” depicts the rocks and old trees with the close-up; the literati paintings were prevailed in the Yuan Dynasty and the theme of “Bamboos and Stones” became the object often depicted by the literati painters, for example, Ni Zan of the Yuan Dynasty, Yun Shouping called his painting “One wood and one stone create an interest of innumerable mountains and valleys” … The formal language and ideographic system of “bamboo and stones” theme was highly matured in traditional culture, so that contemporary artists who use this as a depicted object need to focus more on how to be able to be innovative. 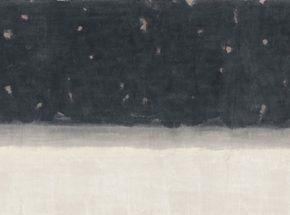 In this exhibition, we find Du Xiaotong’s many considerations on this aspect – “What is the shape of bamboo that has not been restricted by the traditional rules?” “How is the connection between bamboo and stones and space built? 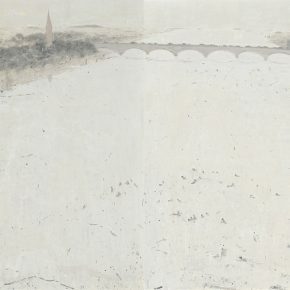 “Bamboo, Stone of Heaven Pool” series and “Tides” series can be considered as Du Xiaotong’s staged “results of carefully searching and rigorously expressing”. 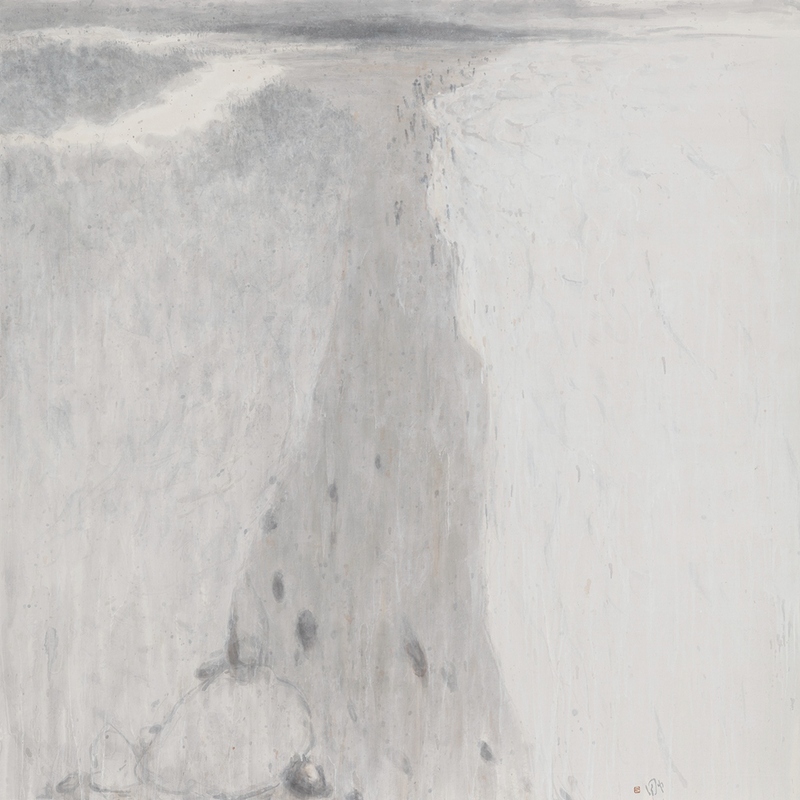 “Retreat from the torrent of time, paying tribute to the self that plays a variety of roles in life, presented as a hard stone standing in a myriad world in which nothing I can do and nowhere I can go, but only standing in the world.” Du Xiaotong believes that painting is only his life state, just like a way to finish his life and his thoughts. Although a variety of forms of “new art” are flourishing now, he has always persisted in painting since he was a student. “The heart is as bright as a mirror, constantly observing and reflecting, silently practicing and abandoning the noise and excitement.” You should concentrate when you do not encounter a trouble, and you should be calm when you encounter troubles. If he persists in it, it is excellent.